The Ann W. Wickman Child Development Center in Atlantic, IA is the first certified classroom located at a YMCA. 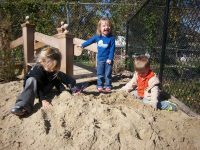 The Center wanted their children to be able to explore various learning areas with close adult supervision while expanding their developmental interests. All areas were designed as child-sized and provide lots of space for children to run and explore. Three local carpenters have helped to build many items for the classroom, including a large wooden train. This area, utilized for dramatic play, represents a historic train depot located in the town and provides a personalized focal point for the classroom. All wooden structures were finished to withstand the weather. As many natural elements as possible were incorporated into the classroom. 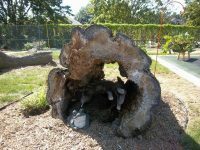 Several logs and sliced sections of logs were placed into the classroom for the children to climb on and to use as furniture. 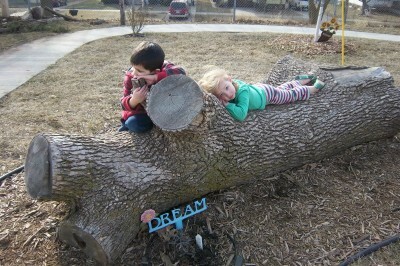 Interesting garden sculptures were added to each area to encourage children’s imagination and curiosity. Trees Forever planted several trees in the classroom and local Master Gardeners helped in planning and setting plants. Plants that require more water and care have been strategically located closer to the building. 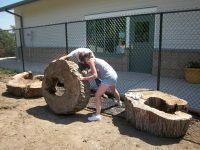 Boulders have been placed in the sand so that children can pour sand over them while large tree stumps are set in mulch to allow the worn bark to fall naturally into the space. 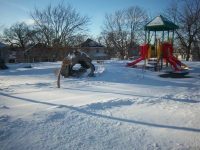 In addition to staff and families, many local organizations have helped make this nature environment a huge success. The local high school Shop Class students chipped in to build above ground planters for the outdoor classroom while the Kiwanis, Jaycees, Lions Club and area Master Gardeners also gave of their time and talent to make this project unique and engaging.